Recently, the Cuban government has been quite busy trying to find justifications. The death of Juan Wilfredo Soto in Villa Clara, the beating of various Guantanamo natives from the Tabio-Ramirez family, and two or three more arrests with beatings confirm the accusations of assassination. A few days ago I received a document, which I have attached at the bottom of this post. 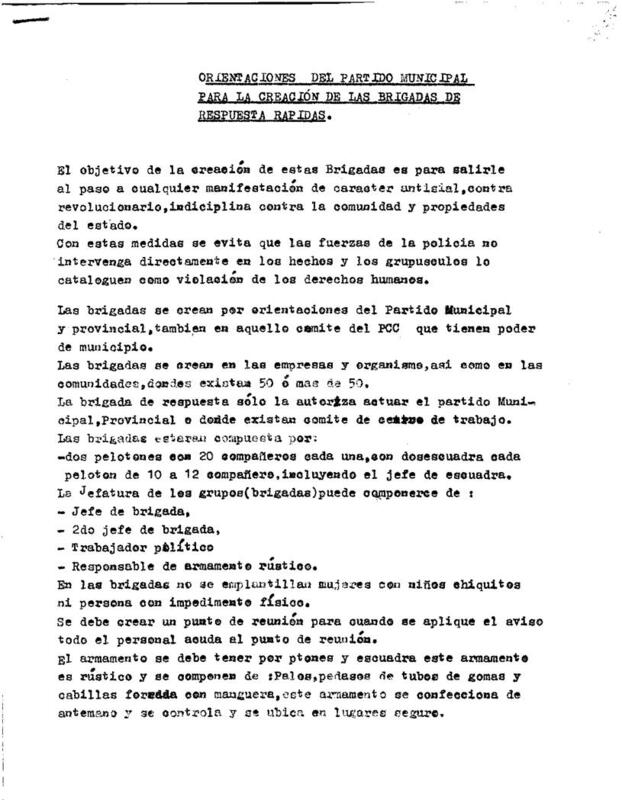 In it are the guidelines of a business in the province of Holguin to repudiate dissidents and other social non-conformists with sticks and iron bars. The photo on the upper part of this post was published by me nearly two years ago. At the time, a reader suggested that it was just a “set-up” because it looked like it was the living room of a house. Today I can reveal it. The photo was taken in the tobacco factory of Antilla. 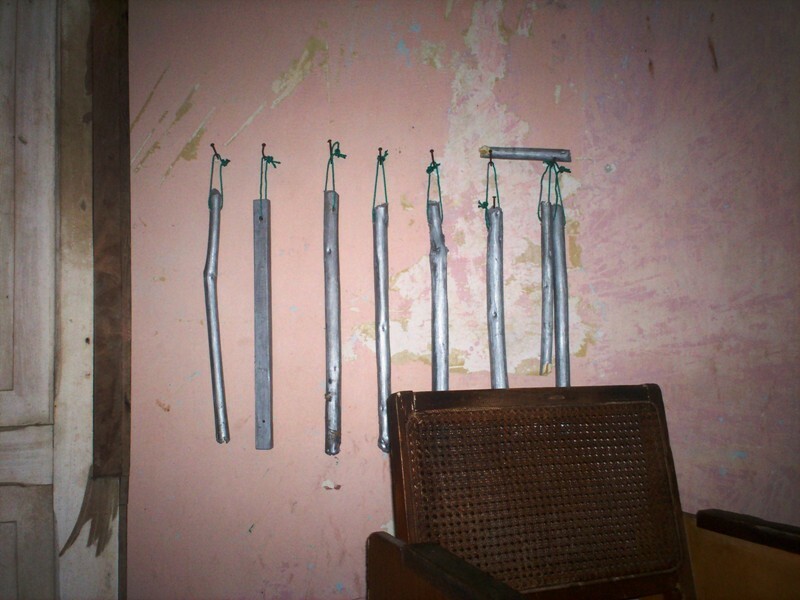 There, they had those metal tubes hanging, visible to the eye, but later they placed them somewhere less visible. 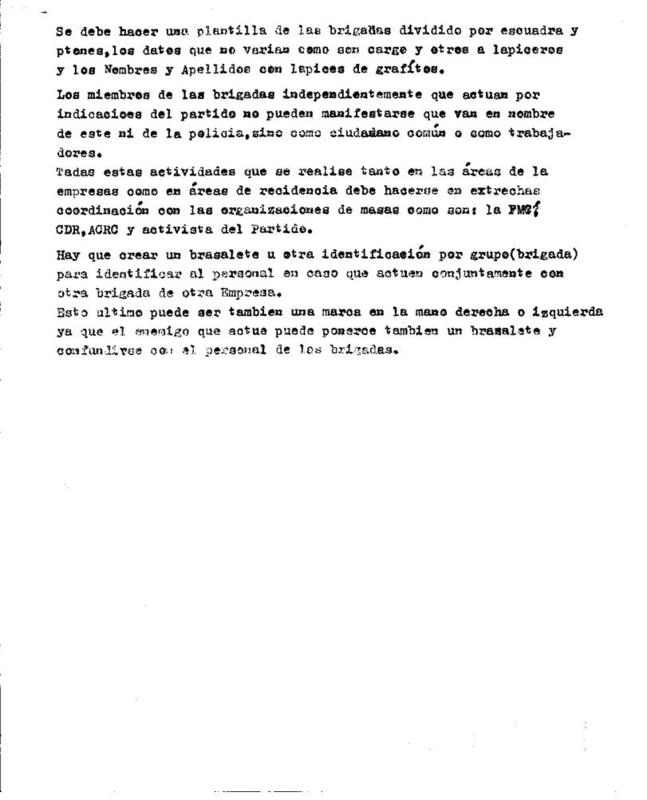 The director of the Holguin business whose document I am today sharing with you is a loyal defender of the supposed benevolence of the Cuban revolution. Among the directions there are two very interesting aspects: 1) that the members of such squads must never reveal that they are sent by the police or by the communist party, and 2) the arms being used must be rustic. The iron bars must be wrapped with cables so that it may seem as if it has been an act of the “infuriated people” who take to the street to defend socialism. A strange and clear connection joins these directions: the report made by Raul Castro to the PCC Congress and the death of Juan Wilfredo Soto. The beating of the Ladies in White before the eyes of international reporters, the violent arrests in Holguin, San German, Placetas, Matanzas, and Pinar del Rio are all part of the same axis. The Rapid Response Brigades sharpen their sticks and bars, and there never seems to be a lack of people who defend these crimes. I owed all my readers these images from the post “The Lie of Lies”. They are direct accusations against a regime which employs men that are capable of carrying out orders that include beating innocent people — among them women. I saw him two times in my life. The first time was in Placetas. I can’t remember if it was at the house of Amado Moreno or that of Antunez and Iris. From there, he left to organize something about a protest we would later participate in, but I did not see him again because he was detained, as many of us were on that afternoon in 2009. On Thursday, April 28th, I went with my wife Exilda to see “Coco” Farinas. Once again Santa Clara opened up to us, and since we entered clandestinely, with the most rigorous of silences, we were able to make it to Aleman Street in the neighborhood of La Chirusa. The incomparable Alicia welcomed us. Coco was traveling late from the capital to the center of the country and that really worried her, but she cheered up a bit upon seeing us. We chatted for more than two hours, and we drank coffee while we awaited for the arrival in Santa Clara of the Sajarov Award recipient. I was towards the back of the house when I heard the doors slam (from the car which had dropped off Guillermo Farinas), and then the doors of his house. I heard the voices, the “take care”, “get some rest”, “we’ll see each other tomorrow”, “come early because we have lots of work to do”, “Goodnight Alicia”, etc. Out of curiosity, I took a look that way. What I saw was the shadow of a man who was bidding farewell to the family and who then disappeared into that warm night. When Coco saw me, he regretted not having introduced Juan Wilfredo Soto — The Student — to me. But he assured me that I would see him the next day “right here”, Farinas said, when the Digital Cubanacan Press Newspaper would hold a meeting. We spoke until dawn and we decided to leave without getting any sleep. We returned to Holguin and two days after I would head out again and travel all across Cuba to Havana. A week later, 7 days to be exact, he received the beating, the hospitalization, and then came his death, the infamy, and the official slander in the only newspaper which exists in the country. I know that this is a rather strange chronicle, for it is the story of a friendship with no other basis than the desire for freedom. Now I search for differences among the voices which surround me these days: “The Student was my friend!”, “Juan Wilfredo would have been my friend!”, I’ve said without people understanding me. I know he can hear me, and I don’t lament the disconnection. For some holy reason we will see each other once again. We will finally be able to hug each other like we were supposed to that night, and he will no longer be a shadow with his arm held high, or a voice that says “goodbye” over the lamp in the house of Coco Farinas. “We have never lied to the people. The unity of our people is not based on the worship of an individual or of the cult of personality of a certain individual. It is based on a solid and profound political conscience. The relationships of the direction of our Revolution and the people are based on conscience, based on principles, based on proven loyalty, and among other things, based on the fact that we have never lied to the people”. – Fidel, July 18th 1985. That’s what the cover of Granma looked like this past May 11th in order to justify the death of a human being from Santa Clara just a few days prior. But it turns out that not telling a lie means not to speak it. When, in your country, while you try to sleep at night you are haunted by the images of your beaten friends, of women who have shared a lump of bread and a bit of watered down soda with you, or have slept next to you on a train while trying to move from one place to another or to help someone in need, then the truth dies or is injured. 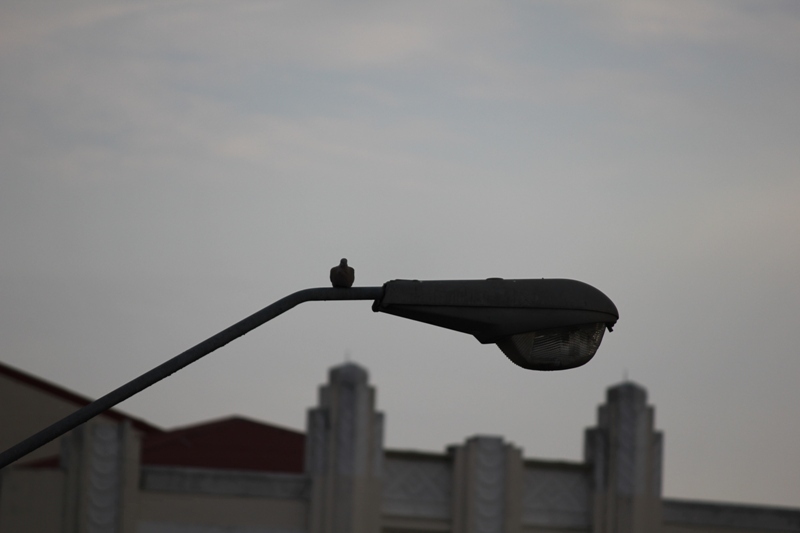 The photos which come along with this post were taken in Caimanera, Guantanamo, and Bayamo. And while all the women are not beaten, nevertheless they are testimonies of just how much humans are hurt when a totalitarian government wants to impede the flood of freedom which inevitably rushes upon them. 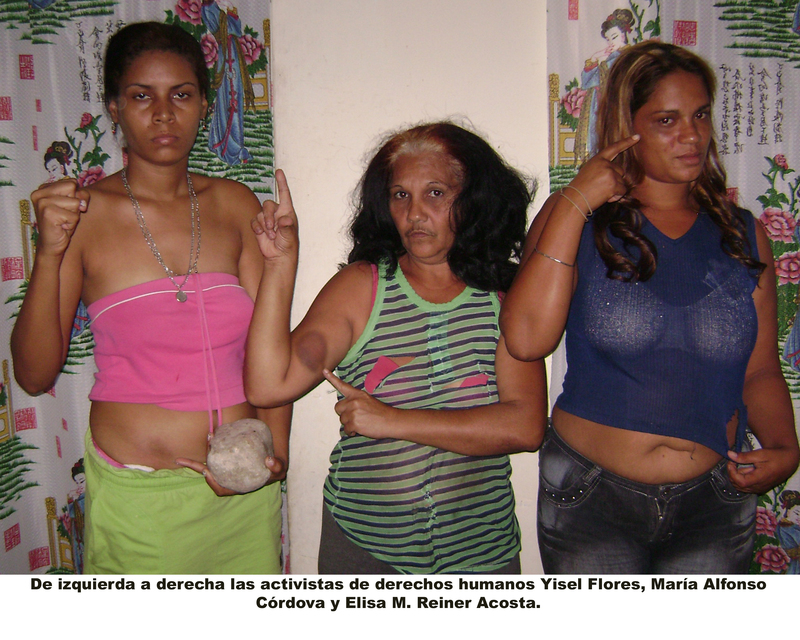 Yisel Flores, Maria Alfonso Cordova, and Elisa M. Reiner are three dissidents toward the regime; they reside in the municipality of Caimanera in an enclave which is special because of its location near to the American Naval Base of Guantanamo. On January 27th they were brutally beaten under the orders of the so-called State Security, the National Revolutionary Police, and their paramilitary gangs known as the Rapid Response Brigades. The beatings of Caridad Caballero Batista, Martha Diaz Rondon, or Reina Luisa Tamayo Danger have also been denounced in this blog. 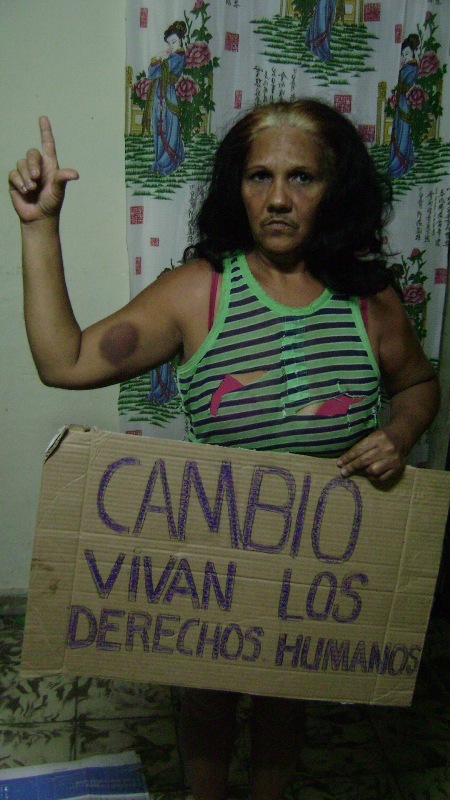 Yakelin Garcia Jaenz was beaten in Bayamo this past February just for opposing the imprisonment of her husband, Ariel Arzuaga Pena, and while attempting to respectfully commemorate the death of Orlando Zapata Tamayo. 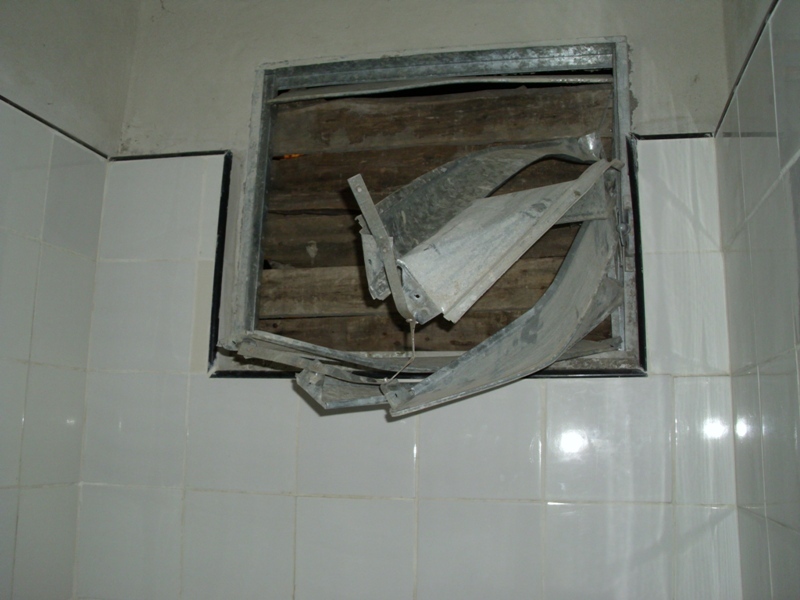 The windows of her home were destroyed by the mobs, while absolutely nothing happened to the aggressors. Today, Ariel awaits a trial with the prosecutor requesting a sentence of 8 years in jail. The government continues, the lies flow, and truth awaits at the bend of the road. Now is when I was able to publish this post which should have been uploaded along with the documentary but I am sure all of you “out there” will understand why it took long to do so. 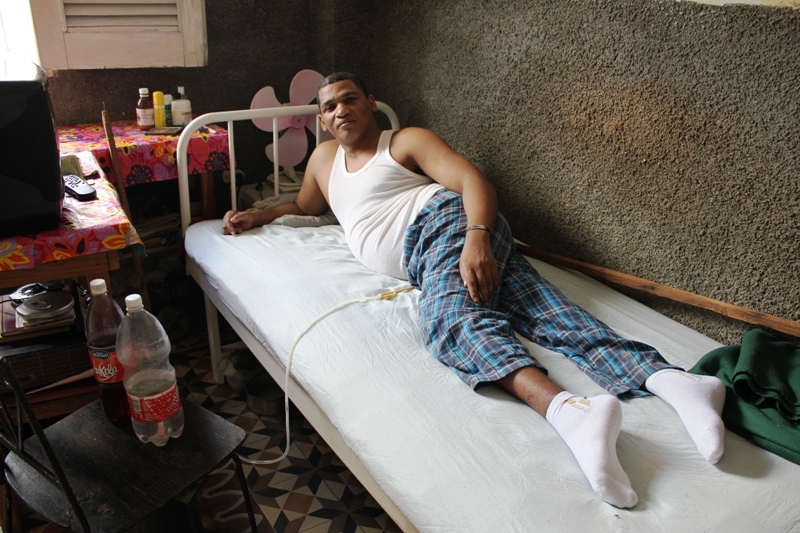 A year ago I wrote about Alberto Lairo Castro, a young Holguin native who in 2007 was a victim of a “Double Nelson” lock applied onto him by the National Revolutionary Police in order to immobilize him. This lock is often used by the Police forces to suppress the population. Alberto was left disabled. His prolonged hospitalization caused him various sores on his back, while his torturers were freed of charges twice. Caridad Caballero and Fidel Garcia Roldan took me to him, showed me a recording made with a photo camera, and I then started spreading the story. One year later I decided to make a short documentary without any other pretensions but to play with real time in a way that my new audiovisual experiment would showcase the story with the actual filthiness of the atmosphere and compress the actual feelings behind those chipped walls of that tiny apartment where Lairo Castro resides. I recorded it with a Sony-Everio camera which was given to me by Malena, a charitable soul who believes in the maxim of Theresa of Calcutta: “One must give until it hurts”. The less trained spectator may feel that the sound quality is mediocre, but surely they will establish a connection with Alberto. The noise which can be heard in the background of “Why do you Beat Me?”is the same noise which annoys this young paralytic all day and night. 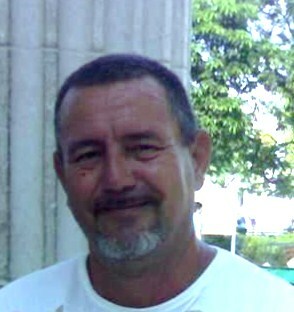 He lives just two meters from one of the most central streets of Holguin — Pepe Torres, between Marti and Frexes. Lastly, I traveled 800 kms between San German and Havana in order to upload this documentary onto the internet. In Santiago de Cuba it was impossible for me and I spent a fortune on Internet cards in the cybercafe. In the end, I was not able to complete this in either of the two cities. The connection was horrible, so I turned to my friend Orlando Luis Pardo Lazo, and I am infinitely grateful for his collaboration. OLPL was not able to put it up on my YouTube account, so he put it up on his own and I immediately received a wave of congratulations and gratitude. Two Holguin natives who now live somewhere in the South of France sent me the link and told me they are willing to spread it around their friends. That is one of the best ways to help. Some years have passed since I started thinking of the world in terms of fiction and poetry. Now I ask myself why I am not interested in fictionalizing some lies or some truths which produce some harrowing chills. I have asked myself numerous times. In my mind, I can see the image of Jose Cano Fuentes — a Guantanamo native who was beaten by the political police in Santiago de Cuba. His face is purplish because of the bruises. 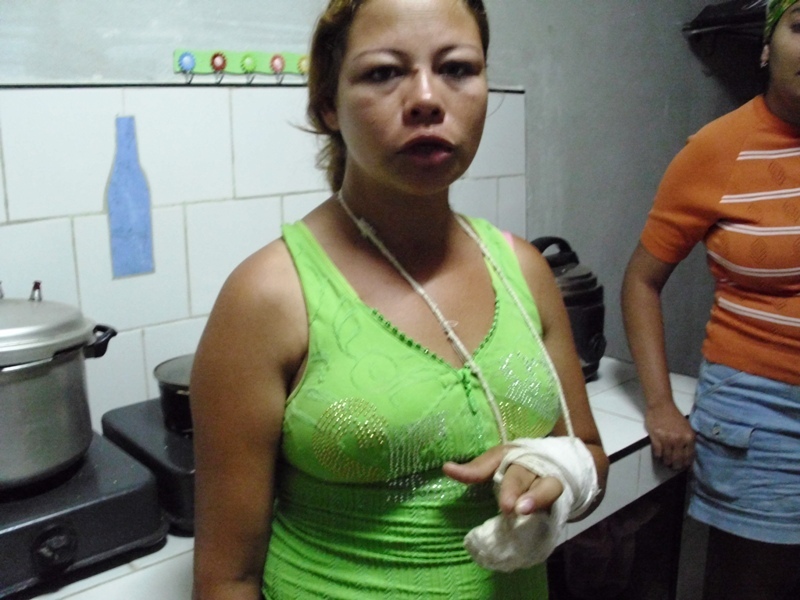 I am then frightened by the wince of pain of Martha Diaz Rondon some days after the malevolence inflicted by state security in Banes on October 31st of last year. Some things are simply better suited for writing testimonies and not for literary skirmishes for contests I am no longer invited to. The family of a very well-known cinematographer was infuriated when I quoted the words of a high-ranking Cuban official directed towards the festive and rebellious atmosphere which a certain provincial film festival inspired from young participants. I received a tier of reprimands, but the mentioned functionary did not. I could try to write a good comedy, a variety show of our times. However, I am not inspired by that kind of usurpation of collective memory. It’s just one more attack for another detailing of what is a public act and what is not. Just another alert on how those I can now call “my new readers” have diversified or have not let themselves be induced. The literary event becomes global as soon as a local subject is brought up. It gets held up and becomes rancid when a woman from Las Tunas who studied my same profession in the 90’s and who now lives in Lausana, Switzerland asks me to report news about the area where she lived until recently. What matters to me is to make a proper geography of my experiences. However, I must tend to certain requests from some of the most loyal readers of this blog, those who visit the site to know the latest happenings of this asphyxiated world in which I am still breathing and therefore I should not disappoint them. On occasion, when I attempt to balance the story of the victims and their contingent problem, these pieces of desperation are tragedies worthy of Felix B. Caignet. I think the real fruits will occur when they understand why I can never remain quiet, because my only compass is to not lie and feel like a dignified man.